There are many species of ground beetles. Nearly all of them as adults and larvae feed on other insects and some are very beneficial. Some ground beetles as pictured here prey on quite large caterpillars that are frequently stalked at night-time. 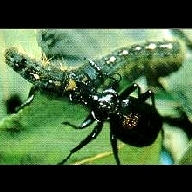 A ground beetle attacking a forest tent caterpillar.